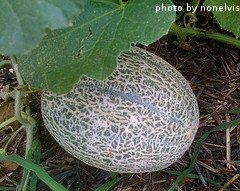 When fertilizing cantaloupe, pay close attention to the fertilizer you are using and the growth stage of the plant. Using the wrong fertilizer at the wrong time can cause problems, leading to very large plants that produce few fruit. It's also important to keep the soil in your cantaloupe patch evenly moist. 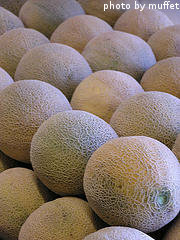 Melons are heavy feeders and sensitive to drought, so a steady supply of water is essential. Your cantaloupe plants will need lots of water up until the time they start to bear fruit. However, if you over-water, the root systems will become waterlogged and the plants will die. 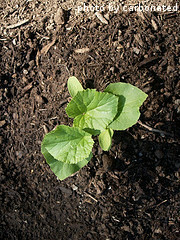 Cantaloupe plants do well if they get about an inch of rainfall per week. If no rain falls in your area, you'll need to water the plants yourself. It is common for the leaves to wilt in the afternoon hours because of the heat. However, they should bounce back nicely overnight. If the leaves are still wilted in the morning, your plant needs water. Drip irrigation systems and soaker hoses work best, but they can be expensive to purchase and install. Watering cans or jugs or even a plain garden hose all work well for watering cantaloupes. They key is to water deeply and slowly. Keep the water pressure down so as not erode any soil and expose the root system. Focus your efforts at the base of the plant and avoid watering the foliage, blossoms or fruit. Water enough so that the soil will be moist 4 inches deep. It's better to water deeply once or twice a week rather than watering shallow several times a week. Cantaloupe roots run deep and they do better with long deep soaks. It's also better to water in the early morning hours. This way, any water that accidentally gets on the foliage will be evaporated by the afternoon sun. If the foliage stays wet for extended periods of time, the chances are much higher that your plant will develop diseases and fungal infections. A layer of mulch can be applied underneath the plants. This will help prevent weeds from growing and will also keep the soil most around your plants. Grass clippings, chopped up leaves and straw all work well as mulch. At the end of the growing season, these organic materials can be tilled into the soil, adding more nutrients to your garden. Once the fruit has set, cut back on the watering to once every 10 days or so if no rain falls in your area. At this stage, the plant is producing sugars in the melons. If the plant gets a lot of water at this point, the sugar content will be less and the melons won't be nearly as sweet. Cut off watering all together about a week before harvest. This will give the plant the best chance to concentrate the sugars in the fruit. You should not be fertilizing cantaloupe until after the plant is at least 4 inches tall. At this point, you can apply a dose of balanced fertilizer. If you want to use granule type fertilizer, choose one with a 10-10-10 or 5-5-5. Pay attention to these three numbers, as they indicate the amount of nitrogen, potassium and phosphate in the fertilizer. Scatter the granules on the ground around the plant at the rate suggested by the manufacturer. Most granular fertilizer are applied at a rate of 1 1/2 pounds per 100 square feet. 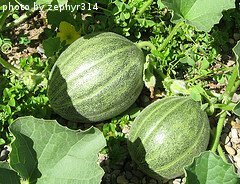 When fertilizing cantaloupe with granules, do not let the fertilizer come in contact with the plant as it may cause it to burn. Water the granules in well after scattering them so that they dissolve and soak into the soil. You can also use a water-soluble product when fertilizing cantaloupe. Choose a well-balanced fertilizer for fruit and vegetable plants and mix it with water according to the manufacturer's directions. Apply once or twice when you would normally water your plant anyway. 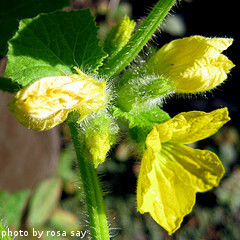 Cantaloupe plants can be fertilized again after the blossoms appear. At this point, you want to use a fertilizer with much less nitrogen than phosphate and potassium. If using a granular type fertilizer, choose a formula such as 5-10-10 or 2-12-12. More potassium and phosphate will help you plants develop fruit. If you add a nitrogen-rich fertilizer as this time, the plant will get very large but won't produce any fruit. If you want to use a water-soluble fertilizer after the plant flowers, choose one with less nitrogen. A good option is African Violet Food. Liquid seaweed is also a good fertilizer that is rich in potassium and phosphate. These products are available at your local garden center. We typically fertilize our melon patch with a balanced granular fertilizer a few days before we plant. We scatter it on the ground, water it in and then till one last time before we plant. After that, we switch to a water-soluble fertilizer and apply it when the blossoms appear. If you want to grow cantaloupes organically, you can mix in compost and well-rotted manure into the soil before planting. You can also use fish emulsion or other organic fertilizers to feed your plants throughout the growing season. Again, these products are available at your local garden center. Now that you've learned about watering and fertilizing cantaloupe, it's time to think about harvesting those sweet melons.